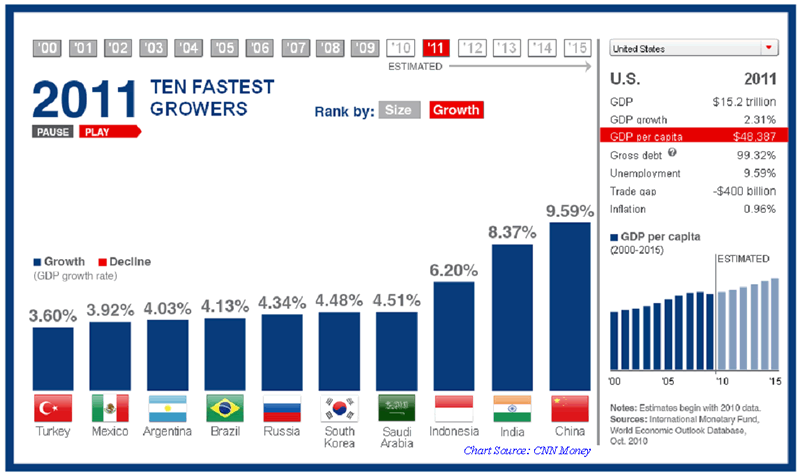 China Outlook 2011 and the Next Decade, Is the Smart Money Right? The country has major infrastructure issues, troubling population dynamics, poorly aligned employment outcomes, inflation problems, a real estate bubble, an opaque and potentially insolvent banking system (had mark-to-market accounting been applied), geo-political problems with North Korea and Taiwan, and an underperforming stock market in 2010 (see stock comparison chart). While the hot money is flooding into China, the smart local money is doing everything they can to get their money outside of China, which partly explains why Shanghai SE Composite has underperformed other markets for the past year or so (see Comparison Chart). The many issues of China could conspire to become the biggest train wreck waiting to happen, and potentially dwarf any little budget problems in Europe by a factor of ten. China has a population related societal structural problem. The nation has tried to utilize the vast manpower to its advantage over the last two decades building a powerhouse manufacturing economy through the availability of low cost workers, which supplied the world with lower cost goods. Nevertheless, the harsh reality is that the nation's infrastructure, quality jobs, food, and overall resources are too scarce to support such mass population, while achieving the government`s goal of a smooth transition to a developed middle class to sustain an internal demand model going forward. If you think having riots in Greece over the pension retirement age being raised is bad, just wait till riots breaking out in Beijing and other cities over a 90 cent bowl of noodle soup now costing four dollars due to food shortages, and a runaway inflation problem. This is only reinforced by some of the news events taking place over the last three months. Let`s start with the raising of banks reserve requirements by the central bank, which is the sixth such increase in 2010. These measures are meant to curb the excess lending which has fueled much of the overbuilding and real estate speculation occurred over the past two years as China`s central bank initially wanted to avert a recession by artificially creating demand for workers and construction projects to replace lagging demand from the developed economies. The problem is that too much lending has occurred, and bad lending at that. Because of the cheap available credit, now you have cement companies and manufacturing firms getting bank loans to invest in endeavors such as real estate, which is outside of their core expertise and competency. The result is a bunch of excess inventory and poorly thought-out construction projects which have no means of recouping the initial investment needed to repay the bank loans. This practice is similar to Spain`s situation now where they have entire uninhabited building complexes that have yet to be marked to market, and will probably ultimately be demolished. But at least in Spain, even though it was a construction boom, it was engineered by developers in Spain, and not by some manufacturing outfits like those in China. So, multiply the bad business project factor by ten and you get an understanding of the magnitude of bad loans on the books of Chinese banks. The problem is being further exacerbated by the practice similar to Spain`s of banks making additional loans to the businesses just so that they can then turnaround and pay back the interest owed on the original loans. The only way this would work out is if these projects magically develop revenue streams. Unfortunately, in the case of Spain, a 20% unemployment rate, coupled with a still overvalued housing market in which prices still need to come down significantly, would suggest that by the time the Spanish economy recovers enough to support the excess inventory, the abandoned projects are run down and uninhabitable. A similar scenario could play out in China as well. Furthermore, China`s practice of overbuilding at the height of real estate valuations makes even haircuts on loan write-offs an untenable practice for banks, and by further throwing good money after bad, the ultimate mark- to-market effect could be catastrophic for Chinese Banks. This is the main reason all the major Chinese banks have gone to the market in 2010 to raise more capital before investors wise up to the underlying deficits these banks face, as these bad loans eventually would need to be written off the books. Victor Shih, a Northwestern University professor estimates that Chinese local governments borrowed some 11.4 trillion renminbi at the end of 2009, and that local government financing loans to be roughly one-third of China's 2009 GDP. Shih reckons the most likely scenario over the next few years is that there would be increases of non-performing loans ratio from local governments. This would require a large scale of recapitalization of the Chinese banking system, which would eat up a large share of China's foreign exchange reserves and possibly slow down growth. I do believe Beijing is quite capable of a few bailouts and surviving a widespread banking crisis, but this most definitely will not bode well for the financial markets. That's most likely why you see insiders removing capital from direct exposure to the inevitable re-pricing that will happen throughout Chinese markets from real estate to the stock market. This can be seen at this early stage by the underperformance of the Chinese stock market compared to other global markets. Remember, foreigners cannot invest directly in these markets, so these capital outflows are truly the smart money. Next let`s look at the recent news regarding a severe cutback in automobile registrations in Beijing to 240,000 in 2011 from 700,000 registered in 2010 by the municipal government. Other large cities in China are bound to follow. This is most likely related to the reported 9-day traffic jam on the Beijing-Tibet expressway in August, and other extended traffic jams throughout China in 2010. China is trying to build infrastructure projects after the fact; whereas with proper central planning these should have been established far ahead of the massive transition from a rural, agricultural based populous to that of a modern, large city based business and manufacturing concentration. Simply put, it is impossible for all the Chinese citizens who want and can afford automobiles to be able to own and utilize this form of transport without a total breakdown in the transportation system. We are seeing the early stages of complete and counterproductive gridlock in the transportation system of China, and it is only going to get worse over the next decade. For all the talk about how China graduates more engineers each year, and other college educated young people who have strong backgrounds in the hard sciences than most developed nations combined, this is actually another sign of problems to come over the next decade in China. China`s wealth and emergence into the second largest business economy hasn`t been built around the need for these types of mind and skill set. So literally you have a large mismatch between the types of available jobs in China, that are supported by the heavy manufacturing and construction intensive focus of the past twenty years, to that of the recently educated pool of graduates who have grown in sizable numbers over the past five years. This results in a large human asset class that China is currently wasting, as most of the newly educated workforce is working in jobs which require little or no advanced education at the university level. So you have highly educated university graduates in areas like engineering and accounting working low level service and sales jobs that pay less than many manufacturing jobs. In short, there are too many highly educated Chinese citizens graduating each year for the number of jobs available needing their skill set because China`s economic model isn`t built around these type of jobs. This type of misaligned employment outcomes never ends well; it usually manifests itself in increased civil and social unrest. The next major challenge for China is a skyrocketing inflation, which at its root is the fact that there are too many people chasing too few resources. This fundamental flaw in population dynamics underpins many of the problems that China faces going forward. Recent CPI data for November illustrates the inflation problem in China with a reading of 5.1% from a year ago comparison, this is up from a 4.4% reading for the previous month. Couple this with the latest 4% hike in fuel prices in China because of rising oil prices, you could expect future CPI and PPI reports to reflect even higher rates of inflation. For now, most of the year over year spike has revolved around higher food prices as energy has mainly been flat for 2010 thanks mostly to government subsidies. Now that energy prices have entered the picture, China will start to experience even more inflation pressures in 2011. Furthermore, with the undervalued yuan pegged to the dollar, it is only getting worse for China in 2011 due to Fed's QE2 pressures on the dollar. The real inflation rate for Chinese citizens for 2011 will probably approach 8% next year. An Asian Contagion by China? This escalating inflation concern is further compounded by Beijing's lack of decisive action to combat the problem by delaying a much needed currency appreciation, and hiking interest rates in a timely fashion. There is no getting around the fact that these two things need to occur as soon as possible. By the time the Chinese government is forced to implement these tightening tools, the damage to the economy is most likely already done. The longer China delays the inevitable serious tightening measures, the harder the economic crash that will occur in the aftermath of these policy changes. And it is unlikely to end well. The resultant impact will probably take the rest of the Asian economies down with it – an Asian Contagion scenario. Eventually central planners and finance ministers around the world might start to understand that policies which lead to bubbles being formed in the first place are counterproductive in the long run. But until that lesson is learned, it seems like we are doomed to repeat the same mistakes over and over again. Right now, there are more and more signs coming out of China that all is not well with its economy, and the likelihood of a more severe downturn in the future is a distinct possibility, unless its policy makers take decisive and prudent actions to minimize the damage of a hard landing.